New US sanctions against Russia prove Washington's desire to make Putin pay a real price for his aggressive actions. U.S. Senator John McCain, Chairman of the Senate Armed Services Committee, released the relevant statement on President Trump signing into law the Countering America’s Adversaries Through Sanctions Act that strengthens and expands sanctions on Russia, Iran and North Korea. 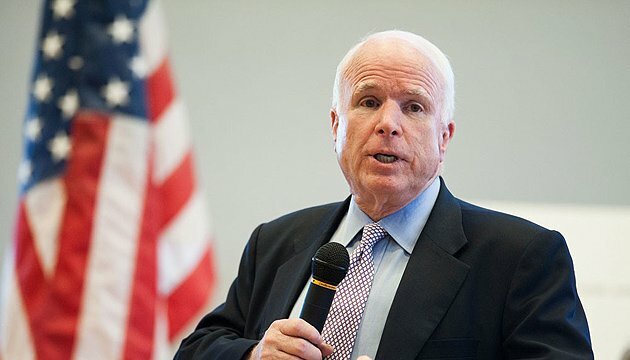 "While the American people surely hope for better relations with Russia, what this legislation truly represents is their insistence that Vladimir Putin and his regime must pay a real price for attacking our democracy, violating human rights, occupying Crimea, and destabilizing Ukraine," McCain says. He also expressed the hope that President Trump would be "vocal about Russia’s aggressive behavior." "The enactment of this legislation, which enjoyed overwhelming bipartisan support in both houses of Congress, sends a strong message to friend and foe alike that the United States will hold nations accountable for aggressive and destabilizing behavior that threatens our national interests and those of our allies and partners," the U.S. Senator said. As a reminder, yesterday, US President Donald Trump signed the Countering America’s Adversaries Through Sanctions Act which inter alia provides for stepping up pressure on Russia and supporting the sovereignty and territorial integrity of Ukraine.